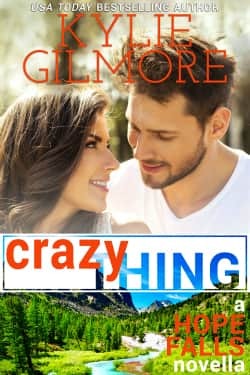 My novella, CRAZY THING, is out in Melanie Shawn's Hope Falls Kindle World. Fans of Hope Falls, will get waitress Kelly King's POV for the first time! Get your copy at Amazon. Kindle Worlds are collections of novellas set in another author's world. Since Amazon invented Kindle Worlds, the stories are exclusive to US Amazon/Kindle, but Nook/Kobo/iBooks readers can still read it on the free Kindle app. International readers can read it by opening a US Amazon account. Hope that workaround helps! Christina has been burned in marriage before and knows marrying Griffin would be the kiss of death in their relationship. Just look at the disaster with his first wife. But when Griffin is spotted in the press with not one but two beautiful women in Hope Falls, California, Christina has a few choice words to say. To his face. Can two people with scarred hearts leave their pasts behind? Or will Griffin and Christina find the spark of hope they need in a small town called Hope Falls?